Our January CLIENT OF THE MONTH – Caroline! 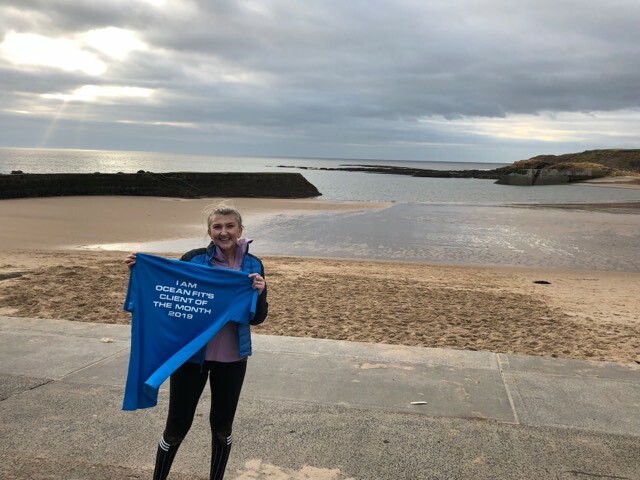 Here she is, Ocean Fit’s first CLIENT OF THE MONTH 2019! Caroline has been a member now for almost a year, she is fantasticly friendly, punctual and works so SO hard in each and every session. Every thing is done with a smile on her face and is up for each and every challenge. She is so deserving of this recognition for so many more reasons. Check out her Q&A below! I started in March 2018. 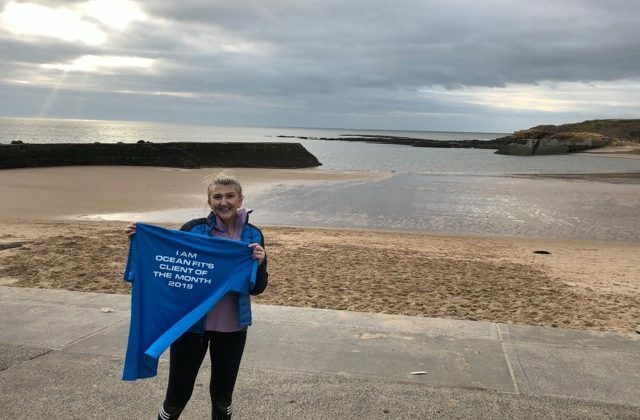 I recently had an operation on my back, and while I was off work, I thought it was time I done something to motivate myself to be more active, as I moaned I was putting on weight, and my confidence about my body decreased, as I felt down about myself. Jasmine Phillips – She meets and greets everybody at the door with a wagging tail. What made you choose Ocean Fit? I chose Ocean Fit, because it is local, and the times for the morning fit camps fit in with my work and family life. Also on first contact with Aaron, he was friendly, professional and a very positive person, which gave me the confidence to sign up!! AND the reviews I read were really positive. For me is consistently attending , and making it part of my daily routine. I am loosing inches, and toning up, which I set up to do. Also completing the 2 of the ’12 days of Fitmas’ (A challenging Christmas session) was an achievement, being able to complete both days, which I would have never achieved when I began, showing I have built my fitness up. The ski machine, I like it because it challenges me to beat my previous distances and its a great full body workout. Without a doubt!!!! I cant praise it enough!!! 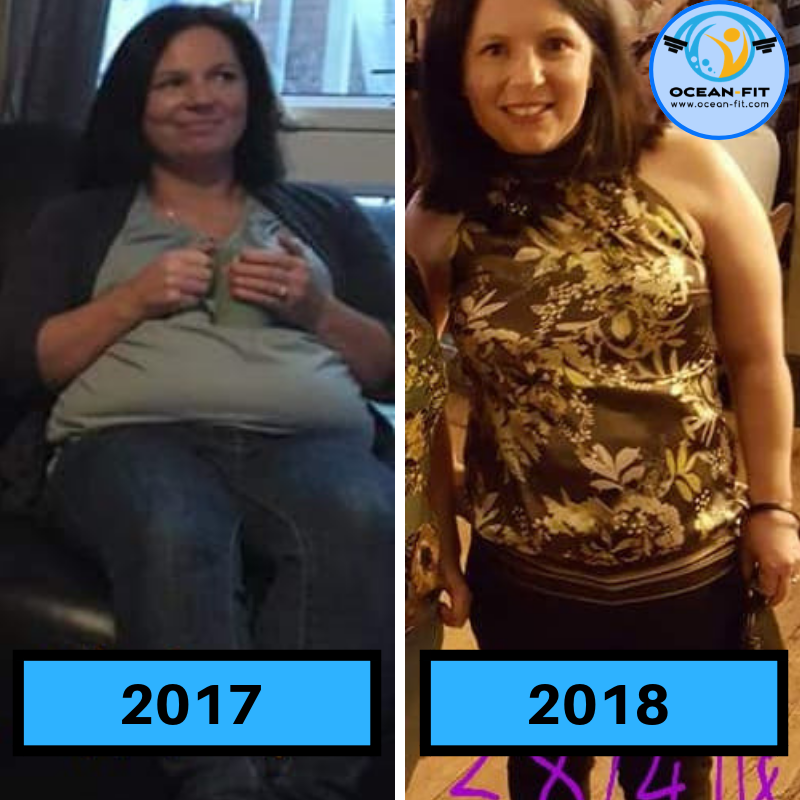 When I first started, my main goals were to lose weight, get fit and tone up, along the way I have made friends and I feel amazing after every session, I have a buzz, the feel good and euphoric feeling the rest of the day, which family and friends have noticed, and if this is what Ocean fit does for me, I would recommend this to everyone. Since I joined, my sister has joined and my friend has started The Body Confidence Programme. I love cooking, especially traditional meals like cottage pie, mince and dumplings, casseroles, using fresh ingredients. Completing the 250 Burpee Challenge!!! Excellent local training facility which gives you 100% support to reach your goals to make you look and feel good. Any additional comments – memories, funny moments etc.. I thoroughly enjoyed the 2 hour fundraiser for the RNLI, I was so nervous, but when I got there, everyone was in good spirits and dressed up, and there was a great buzz in the air, and I had a laugh doing it in between. Its excellent to feel part of the ever growing Ocean fit family, and of course, Jasmine is the sweetest dog ever! Our RNLI Christmas 2 hour Fit Camp back on December 8th. Caroline is 2nd left from the front! Truly, truly deserved. Caroline is so dedicated and laser focused to each and every rep and session she does. She has earned everything she has achieved so far and will continue to develop each and every session. If you would like to know more about our Indoor Fit Camp and how to get involved simply email or call us for more information. NATALIE – OUR NOVEMBER CLIENT OF THE MONTH!